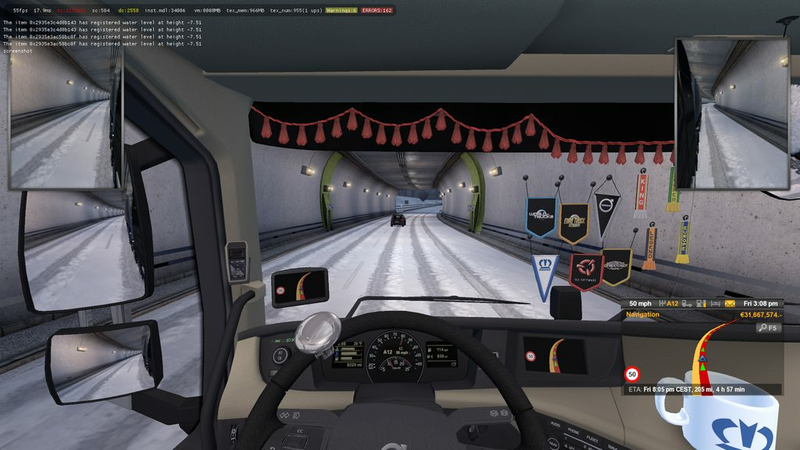 Your Winter Mod on Truckers MP in this winter 2018 like a year ago? Not sure, they usually send a message around this time but I haven’t heard anything from them. You would have to contact them, he waited and the community with them. Oh man it’s very good, very nice! The download is going back and forth from an hour to half hour, what’s up with that? But other than that, can’t wait to try it out once it’s done! Great thanks for this new update and the others too. Great job as always! If there’s one negative thing I’d like to point out.. It must be, I can’t really feel the physics mod doing anything. Could it be cause’ I changed some physics settings like Squrrel showed in one of his last videos? Maybe those settings override the physics mod, I’d need to check it, although if you drive carefully you might not notice it so much, you should have less braking distance and have to slow down more when going round bends but if you’re not careful you’ll crash all over the place. I just sent you a small tip to congratulate you and I hope everybody can do it, so we can all show our gratefulness to you for providing many gorgeous and magnificent mods *for free* (amazing). Merry Christmas everybody! Many thanks for the donation Alejandro, much appreciated. Thank you very much! Winter IS coming! Sent you a small reward for all your hard work! Merry Xmas from Sweden! In terms of priorities what should I put higher? Frosty or heavy winter? Thank you for your help and your work! Thank you, heavy winter should be higher than Frosty. Been playing ETS2 for almost five years, now. I found your mod just the last year, and I just can’t find anyone else with your willingness to make a convincing winter aesthetic. To show my thanks, I just donated. Here’s to hoping SCS pulls up your name for a seasons update. Many thanks for the donation, much appreciated. Thanks Zuputo, I changed those old railings years ago when I first started doing this mod, I’ll have a look at it. My mod manager does not see this file. What i have to do? Maybe there was an issue with the download, you might have to try again, the file size should be 985mb. Hi. Nice with snow and the lightning. But not slippery as expected with snow covered roads. Video show my point. Make sure the physics mod is on top in Mod Manager just in case there are any other in there, also in the settings make sure the trailer stability is turned right down. You should watch Squirrel’s video on the new physics settings in 1.33. According to SCS having trailer stability up full is the most unrealistic, having it turned right down is the most realistic. I tested out the physics mod with trailer stability up full and it stops the truck and trailer from slipping around, turn it off and it goes to the way it should be. The issue is that if you apply the other physics settings outlined in the video they may override the physics mod, but I’m not sure about that. Hello! I discovered your work recently. After I opened up my ETS 2 after long time. Installed Frosty Winter mod, everything is very nice, I like that you reduced that ugly HDR bloom, looks pleasing to the eyes now. But I spot the problem, or maybe it’s supposed to look like that?. One texture is kinda greenish, very light green and smooth color texture, where the grass sits on top of it. It looks really strange. Not only in Baltic DLC but also in Scandinavia I saw this. Great work as always Grimes. Merry Christmas from the Fox Den. Thanks a lot for constant quality modding Grimes! That’s not obvious all the time. That’s why I used your donation. You earn it! Wow! New snowflakes is beautiful. Thanks, I think before the snowflakes were far too large, more realistic now I think. omg yeeeeeeeeeees!!! i have what so long for this!!!!!!!! hahahahahaha omg i turn so mutch i can and its not work and soon i tutch a tree and i flying aroud on the road XDDDDDD hahahah i love it!!!!!!!!!!!!!!! Thanks for updating the Frosty mods so quickly, it is just in time for the new SCS World of Trucks Christmas Event that just started today. Grimes, would the physics mod work on ATS? I noticed that ATS Frosty mod doesn’t have a physics mod and I just thought that since the two games are virtually the same ‘under the hood’ that the physics mod might work. I would hold off on the ATS version at the moment, there are many issues with it, I will update it later in the week and give it its own physics mod. Oh man, thank you so much, and you’ll find that Santa has left a PayPal present under your tree this year. Great work needs ‘appreciation’. My German isn’t great so perhaps someone could translate this better than me. Because of the new physics introduced in 1.33 there are issues with the physics mod, changes have to be made to it and a lot of testing but I don’t have time for this just now unfortunately. Thanks for updating. It doesn’t feel like winter driving until I’ve got the glistening snow and ice. Just like home! Merry Christmas from Alberta, Canada! Small donation sent, looking forward to the rest of the mods getting up to 1.33 level! Thanks very much for the donation, hopefully I’ll be able to release updates for the other season mods this week. Hello there. The mod looks great, but including some installation instructions would have been much appreciated. I had to Google it myself, there are no instructions for this specific mod, but on forum posts about ETS2 mods in general it says to just copy the zip file to the mods folder for this kind of thing. The problem is, that doesn’t seem to work for this mod. The mod and add-ons don’t show up at all in the mod manager. With no instructions, I have absolutely no way to find out what I’m doing wrong. Could someone assist me here, please? Unless specific instructions are given all you have to do with most mods is download the scs files and place them in your mod folder. So for example after downloading you should end up with frosty_7_0.scs which is 1,008,549 kb in size, place this in your mod folder, documents/euro truck simulator 2/mod and then when you open the game you should see it in Mod Manager, then it’s just a matter of activating. Ahh, I see the problem. With any other game, the mods folder would go in the game directory, like for example Program Files (x86)/Steam/steamapps/common/ETS2. I must have skimmed over that bit when I went forum diving and assumed that it was the same. It’s odd that it goes under Documents instead, but at least we’ve got it figured out. Thanks for the help! Farming simulator is one of them. Hey! I love your work and especially this mod but there is one thing I really don’t like and it is that there is no snow sound while driving like there is gravel sound while driving on gravel Otherwise it is really good. That was actually something I worked on a year or so ago, I remember it was difficult to implement, maybe I’ll have another go at some point. Physics are a little bit fucked up… I loved much more 1.32 physics. Could you update that for 1.33 and send it to me? I can pay if you want. SCS made a lot of changes to the physics in 1.33, that’s why it’s been so difficult, I’m working on trying to improve it, you could try the older physics version, download above, and let me know if it works okay, maybe I’ll just revert to that one. To be honest I don’t use maps on ATS so I don’t know, maybe someone else will be able to tell you, maybe try asking on the SCS Forum as well. There were issues with the physics mod so I updated it above if you want to check it out. Oh shoot. Il make sure I check that out next time in on. Thanks for fast reply bud. Have a happy holidays! I’d like to thank you for making the only mod in the two SCS games that even comes close to depicting snow. It is as real as it can be, considering that the weather/game engine only allows the depiction of the heavier rain droplets that can only fall to earth fast as opposed to snowflakes, which are inherently lighter than water droplets. These are are supposed to fall to the ground like white confetti would fall, if dropped from an aircraft. Maybe someday SCS will change the game engine in significant ways so as to allow the physics needed to depict ‘white confetti’. Until then I hope that, in the future, you can see your way clear to make an ATS version of the Heavy Winter Weather mod, maybe when the game map gets bigger and the game grows in stature, but hopefully before then. You are one of the few modders that I support financially, when funds allow, because I get the most enjoyment and game realism from your mods. I play both SCS games extensively and realism is key to enjoyment. Thanks very much for the donation Patrick, as you say if we were able to have realistic snowfall that would look amazing, hopefully one day. If you’re using the default version of Frosty try disabling grass, you’ll get a snowy landscape and it might speed things up a bit for you. i must have new baltic dlc to have this mod on default map ? No, it works with or without dlcs. Vintage Coca Cola skins for Owned Trailers. After the seasonal and sound fixes in that order? But I’m guessing I can’t have your winter, summer, spring and autumn addons all installed at once, as I’m guessing they conflict with each other and the game doesn’t know which to use? Cheers in advance for any info on your multiple seasonal mods. Might remove RGM as it might cause conflicts with Frosty but other than that looks good. Cheers Grimes. I’ll pull the realistic and darker night addons out. But I assume your season mods aren’t compatible with each other? No, only use one season mod at a time. Frosty is not compatible with Mario Map. Ohh okey so thanks for reply and merry christmas ! As far as I know, the Mario map is using stolen IP from ProMods and TSM and just about every other hard working modders, it is a cancer in our game and needs to be cut out. Its a shame that there isn’t a way for ProMods and TSM to put some kind of DRM on their content that they work so hard to provide for us to use. I don’t understand why this is happening. My game crashes when I have Frosty in the game. With no other mods just frosty in there are crashes but I have the right version. Do you know why? When the game crashes copy your game log and paste it at pastebin.com and I’ll take a look. You have placed the ETS2 version of Frosty in your American Truck Simulator mod folder. hey grimesmods, does this works in default dlc map?? Yes, it works with or without dlcs. does this mod works in etrs2 1.33?? Many thanks Zuputo, hope you had a nice xmas. is the game same after romeving the mod like before adding the mod? Yes, doesn’t cause any issues with your profile. A tunnel is just a model that is placed over an existing road, they don’t use unique textures so there is nothing I can do about that. can u compress its file size? It’s already compressed, there’s nothing I can about that unfortunately. on l instal ou ? Can’t download it from sharemods, the website just won’t let me download it. There’s an issue at the moment because of download requests from TruckerMP, you’ll have to wait until it calms down a bit. Hey, MP have added support for Wintermod however sharemods is crashing all the time and a lot of players don’t know how to install it to MP. I have made an installer which is downloading from sharemods (with your exact link) (only i can access installer as im testing) but sharemods constantly is going down. Am i able to re-distribute (with credits!) the installer and upload your mods to something like Google Drive? No you can’t do that, it will calm down eventually and people will be able to download. By the way, i will use sharemods but is the installer alright or is that not allowed either. Just making sure. Just to clarify (i cant edit comments damn) but the installer makes you download the files from sharemods and then it finds them in the user’s downloads folder, which then moves the files to ETS2MP/mod.